Alive and Young: Would You Like Some Heterodoxy with You Discernment? Would You Like Some Heterodoxy with You Discernment? I attended a vocation discernment retreat this past weekend, sponsored by a local Serra Club, which was overall productive. The second presentation for the weekend was on prayer, which was delivered by a Cenacle Sister (one of the many women's religious orders the vatican is calling for renewal specifically for what she taught us). Keep in mind, she is presenting a talk on prayer, which is a crucial component when discerning one's vocation, to a large number of young people who will need to use what she presents as a vehicle in discerning his or her vocation; so my expectation for the presentation was high. At minimum I was expecting some quotes from saints and and some references to the section of prayer from the Catechism of the Catholic Church. The section on prayer is actually the most beautiful section and arguably the richest section of the entire Catechism. But I doubt sister Cenacle knew this, for she appeared to be allergic the orthodoxy. After the retreat was said and done, I was still bothered by what the Sister taught. I was bothered to such a degree that I typed the following letter, and I am currently debating on whether or not I should send this to the local Serra Club (who sponsored the event) and possibly the vocations director for the archdiocese. What do you think? Does the letter sound too harsh or too inflammatory? I don't want to sound like an uber conservative religious nut job but as a concerned member of the community. I recently attended the Life Awareness Retreat held at the Holy Name Retreat House in Houston, TX. Overall the retreat was excellent. I would like to raise your awareness to the content of one of the speakers’ presentation. I do not recall her name, but she was one of the Cenacle Sisters who did the presentation on prayer. She began her presentation by defining prayer as “anything that helps us connect with God.” This is a definition of prayer that in my studies of Theology on both the undergraduate and graduate level I have never encountered. 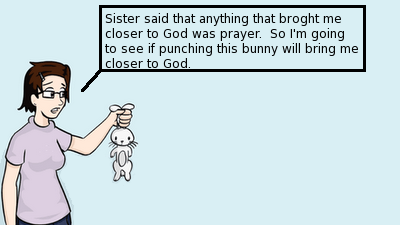 I am greatly bothered by the Sister’s definition of prayer because her definition can be used to justify nearly any bizarre act because one claims it bring him closer to God. For instance, if I thought torturing puppies brought me closer to God, than who is to tell me otherwise based upon the definition of prayer provided by the Cenacle Sister? To me it seems to run the danger of viewing the spiritual life in a relativistic manner. Why the sister did not use the classic definition of prayer given by St. Teresa of Avila, which has been quoted by many Saints and Popes over the years – Prayer is the raising of the mind and heart to God – I do not know. Also, the blue sheet she passed out titled “Forms of Solitary Prayer” is riddled with theological inaccuracies. First what she lists as forms are not forms at all, some are expressions of prayer. This is troublesome on one hand because it hinders the development of a common catechetical vocabulary. For the form of prayer (meaning what kind of prayer you are praying) all fall into four forms: Petition, Contrition, Adoration, and Thanksgiving. When I read her blue sheet, I do not see any of the forms of prayer mentioned. Which saddens me because we had both Eucharistic Adoration and the Sacrament of Reconciliation (which requires a prayer of contrition). To quote G.K. Chester on the thanks: “Thanks is the highest form of thought.” A thanks acknowledges that what you have received is a true and real gift. Scripture time and time again reminds the reader to give thanks to the Lord. Again, why she did not mention any of these forms of prayers that are in the Catholic Tradition I do not know. Several “forms” of prayer on her blue sheet are actually rightly referred to as expressions. Expressions of prayer help us in determining how we go about praying one of the forms. The expressions of prayer are Vocal, Meditation, and Contemplation. The Cenacle sister makes no direct mention to vocal prayer and barely makes a passing reference to dialoging with God; yet, vocal prayer is the foundation for all other forms of prayer. What she referred to as “contemplation” is actually called medication in the Catholic tradition. She makes no mention of true contemplation as being a gift from God and something that cannot be obtained by mere technique and practice. Assuming one can obtain true contemplation by means of techniques ignores the childlike faith and abandonment Christians are called to have towards God. By focusing on technique, one runs the risk of turning a technique into a vain superstition. The Sister mentions the Jesus prayer under the category of a “Mantra.” Calling the Jesus Prayer a “mantra” does not to justice to the rich treasures this prayer contains, as the value of the prayer is not found in the repetition, but in the love with which one prays. It is at the same time and an acknowledgement of Jesus as Lord and Jesus as the Son of the Living God. The second half of the prayer is an acknowledgment that the person praying the simple short prayer is both a sinner and is in need of God mercy. It is a reminder of where we stand in relation to God and God in relation to us. There are at least two attempts to combine Eastern spirituality from Buddhism to the Christian tradition. One is with what she calls “Mantra.” The second is what she refers to as Centering Prayer. These are attempts to Christianize kinds of prayer that do not have scriptural or historical bases in Christianity. I also find this insulting to those who practice Eastern spiritualties and religions as it is akin to a Hindu trying to Hinduize the rosary or a Pagan trying to paganize the Mass. The Vatican has written a reflection on the attempt to combine certain new-age/Eastern spiritualties with the traditions of the Catholic faith. The document is titled “Jesus Christ the Bearer of the Water of Life,” and it cautions against attempting to combine Eastern spiritualties with Christian practice. What Sister calls Centering Prayer is exactly one of the forms of prayer the Vatican warns against. Centering prayer is simply an attempt to repackage and Christianize what is known as transcendental meditation (TM), which has its roots in Hinduism. TM seeks to have a person, by means of repeating a mantra, descend into the center of their being so as to clear one’s mind and move to a higher consciousness. Sister defines centering prayer as a “spiral down into the deepest center of ourselves.” Prayer is not a path inward but it is a ladder ascending to God. Many well intentioned Christians have lost their was by practicing centering prayer because it led them to think that they and Christ are the same, it led them to depression and despair, and it has led some to an the annihilation of the self and a belief that all reality is an illusion. In short my experience with centering prayer is that it is not the light that people claim it to be. As mentioned before, I am bothered by the Sister’s presentation and even more so when remembering the old adage of the Church “lex orandi; lex credendi.” For to pray wrongly is to run to danger of believing wrongly and to believe wrongly is to run the danger of living wrongly which in turn can put another’s soul and salvation in jeopardy. Is their any way to get in touch with the sister herself to ask her to explain what she meant? Looks like a good letter to me and certainly not some nitpicky rant. Certainly the way she taught about prayer was extremely unhelpful and maybe even damaging to someone's prayer life. I would recommend removing the line about torturing puppies. It might be seen as hyperbole and your letter dismissed as disgruntled ramblings. Also, at one point you typed medication instead of meditation.